From the very beginning I was worried about how Ethan would take moving not just from one house to another but moving away from all the friends and family he's ever known. Yes, toddlers are fairly resilient, but this move has certainly not been overlooked by Ethan. Putting him in that box was the only way to get unpacked. He loved it...for about 10 minutes...which we all know is a lifetime in toddler minutes. Our transition period of living in temporary housing was definitely the hardest time for Ethan and well, to be honest, all of us. We were back and forth a lot and our transition housing wasn't exactly what any of us were used to. There was no groove, there was no stable everyday activity and this all left Ethan out of sorts. His behavior most certainly reflected his unstable environment. I think one of the hardest parts of moving with a toddler is not being able to communicate with them what is going on. They are old enough to recognize the change, but unable to fully understand it. Hence, the acting out. Almost immediately after we moved into our new home, his behavior went back to normal. Something I really underestimated was just how much he would miss his grandparents. I knew he had a strong connection with them, but I didn't know how much he was capable of actually "missing" them and their routine appearances in his life. I have all of my photos on a slideshow screensaver and he fell in love with watching it while we were in our transition home. He would constantly ask me to watch the "babies". It's hilarious, but I'm still not sure he actually knows the "babies" are all him, but he did know that his favorite grandparents were there. Shortly before we moved into our new house we purchased an iPad and now his favorite thing to do is watch home videos on it. He could care less about Dora or any type of game. He just wants to watch home videos over and over. 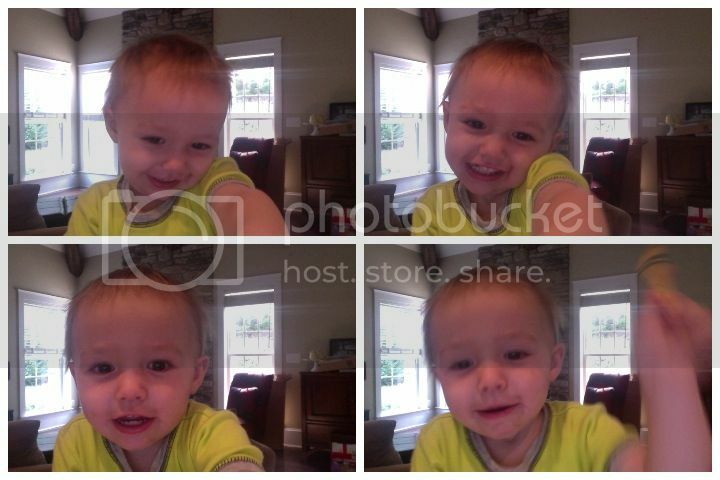 Apparently he learned how to take pictures of himself after getting tired of watching the "babies". Another one of the many reasons I'm thankful for the iPad. It breaks my heart that he misses his family so badly, but it also warms my heart to know that he loves them so much. We are lucky to have family that makes the effort to come visit. Of course, it isn't the same, but Ethan truly cherishes every moment of them being here when they can be. Love that first picture of him in the box!!! Great idea:) Being as close as we are to Meyer's grandparents, I can't imagine leaving. It's so wonderful the bond Ethan has with them and they are only a phone call or a Skype away! It was hard on Connor when we moved in December, too. It took a few weeks to adjust and get him to finally listen again. He was just exploring the new territory, but I wish he would have stayed out of the cabinets and such! The iPad is a great investment. Connor facetimes with his cousin a hour away all the time. It is nice for him to chat with her in between seeing each other. That photo of Ethan is too cute. And yay for 10 minutes of entertainment!! I'm glad to hear he's back to his old self these days. Maybe the grandparents can start face timing on the iPad. We've started doing it with my in-laws in TN and Jack loves it! 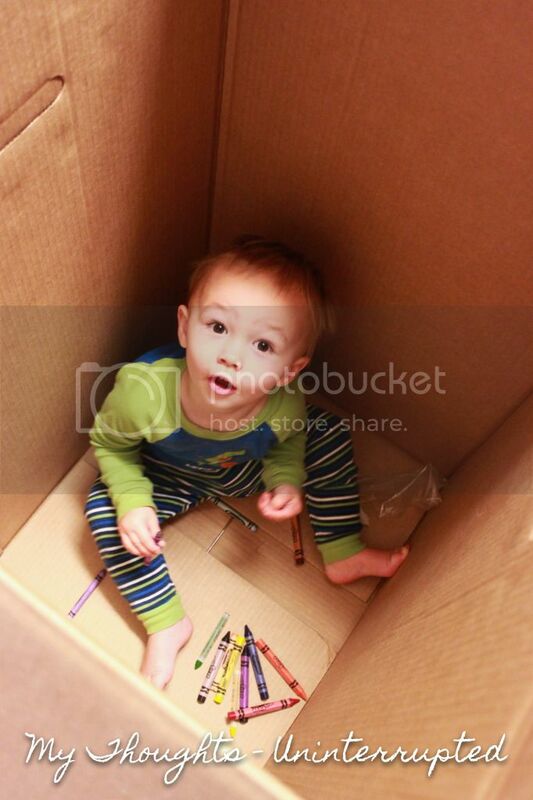 aaww...the picture of Ethan in the box is adorable!!!! The slideshow is SUCH a great idea and I'm glad Ethan enjoyed it:) I hope you guys get back in a groove soon!! I am so nervous about moving. E has done SO well transitioning to big sister that I hope we don't throw a wrench it in when we toss in another big change in less than 3 weeks.